After an exciting and nail biting season last year, which saw a rookie clinch the title, sending the more experienced riders running for cover, MotoGP heads to the 2014 season with rule changes aplenty. For this year, MotoGP consists of two entries; the Factory Option and the Open Category. We are done with the term CRT from this year onwards. As a change, all machines will run an official 'standardised' electronics unit produced by Italian company Magneti Marelli, regardless of whether they are Factory or Open. Entries are distinguished by the ECU software they use, i.e. Factory bikes have the option to design their own software to work with the standard commissioned hardware. Open bikes can only use standard hardware and software combination. This looks to be a clear advantage for Factory bikes again, but here is the catch. A Factory bike is restricted to just 20 litres of fuel for a race (down by 1 litre from last year) and are allocated only five engines for a whole season. In addition the engines will be sealed at the start of the season with freeze on further development. Testing is limited to just three official post-race tests as well. An Open bike (essentially a factory engine on a private chassis) on the other hand can carry 24 litres of fuel, use 12 engines for the season and are allowed to carry out any form of development on the engine. In addition they are allowed to use softer tyres than the Factory bikes as well and are granted unlimited testing. This promises to give the Open bikes a fighting chance against the Factory bikes. The rules also confirm that new MotoGP manufacturers entering as Factory Option can have nine engines in their first year. This is paving the way for Suzuki's return to the sport in 2015. Ducati managed to find a loophole in the new rulings and decided to run their factory bikes with standard ECU software. As a result, this will let them carry unlimited development on their engines and exploit other leverages on fuel and tyres and testing which applies to the Open Class bikes. This could well prove to be a possible advantage over its rivals in the long run. 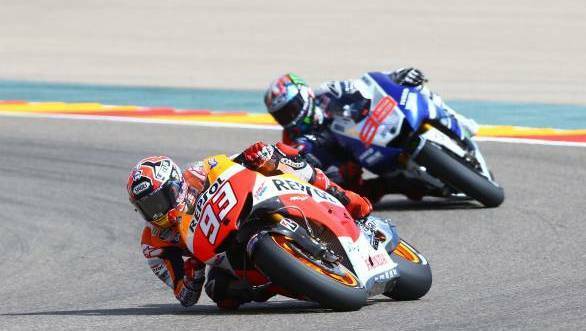 To even out the divergence, Grand Prix Commission reverted with a Factory 2 rule which states that a manufacturer with entries under the Factory Option who has not achieved a win in dry conditions in the previous years are allowed to follow the same rules as Open Class bikes for this year. On the flip side should any rider or combination of riders nominated by the same Manufacturer, achieve a race win, two second places or three podium places in dry conditions during the 2014 season then for that manufacturer the fuel tank capacity will be reduced to 22 litres. Furthermore, should the same manufacturer achieve three race wins in the 2014 season it loses the right to use the soft tyres available to Open Class entries. In each case the reduced concessions will apply to the remaining events of the 2014 season and the whole of the 2015 season. As for 2016, the championship ECU and software will be mandatory for all entries with effect from 2016, thus creating a common platform for all. The regulations have a clear objective of reducing the gap between the Factory and Open Class bikes. Last year CRTs were no match for the Factory machines, so even though they were filling the grid as intended, they were eating the factory bike's dust every race. In fact it was officially a two way championship which didn't make any sense. New rules seem to have brought a new lease of life though, with Aleix Esparago of NGM Forward Racing (Open Category) consistently finishing among the top factory bikes during testing. Ducati too have found their lost pace and are challenging the likes of Honda and Yamaha factory racers much to their dislike. This year's rules, amid many changes and confusion might just prove to be the right recipe for wheel to wheel racing up and down the grid.